The word “seminal” has been used so many times to describe New Zealand popsters The Clean that it’s now almost an unofficial appendage to the band name. So let’s get it out of the way. Yes, the Seminal Clean were the band that kickstarted Flying Nun Records, the little New Zealand label that could, and that was the flagship for some of the best indie music of the 1980s and 1990s. Yes, the band was the launching pad for Bailter Space and The Bats, two of the better-known Flying Nun bands, and their prototypical lo-fi jangle and clang was later popularized by like-minded bands The Chills and Straitjacket Fits. And yes, they were the acknowledged inspiration for latter-day American indie bands such as Yo La Tengo, REM, Camper Van Beethoven and Pavement. All very seminal stuff. But back in the beginning they were just kids who wanted to make some noise and have some fun in the garage. That’s the quality that comes through most clearly on the career-spanning retrospective Anthology, a 46-song, 2-CD (and now 4-LP) compilation originally released in 2003, and now reissued by Merge Records. After a brief, abortive start, the lineup stabilized to brothers David (guitars) and Hamish (drums) Kilgour, bassist Robert Scott, and unofficial but integral keyboard player Martin Phillipps, later founder of The Chills. The place was the South Island university town of Dunedin, and the year was 1979, and everybody in the band liked The Velvet Underground and The Byrds. The former was on everybody’s list of influences; no surprises there. The latter revealed just how isolated and unique the South Island was in the late 1970s. It was the kind of place where a new sound could emerge, and did. The Clean sounded amateurish because they were, in fact, rank amateurs, learning to play their instruments even as they recorded their first singles. But if the rudimentary Farfisa organ, barely competent guitar work and shambolic drumming betrayed a quartet of newbies, they also revealed a band that sounded positively giddy with new possibilities. The real action here is on Disc 1, when The Clean was at its most primitive and visceral. This is a band that didn’t record a proper debut album until 11 years into its career, but the numerous early singles and EPs that make up the first disc are consistently bracing and unfailingly melodic. Debut single “Tally Ho,” famously recorded for the whopping sum of $50, is a timeless garage rock classic, bolstered by Phillipps’ two-fingered organ work and a chanted chorus that would still sound great blasting out of a cheap Radio Shack boombox. “Billy Two” jangles furiously and features another indelible singalong chorus. “Point That Thing Somewhere Else” features a Velvets-like drone and a hypnotic guitar solo from David Kilgour. And those are simply three highlights on a disc that has no lowlights. All of it is ragged, defiantly amateurish and unfailingly melodic and memorable. The band goes (relatively) hi-fi for the songs on Disc 2, primarily culled from the full-length albums Vehicle (1990), Modern Rock (1994) and Unknown Country (1996). By the early ‘90s, The Clean had broken up a couple times, splintered off into both better known Flying Nun bands and now obscure side projects, and had reconvened whenever convenient. They had also learned to play their respective instruments, and the enhanced audio quality and musical professionalism is both marked and somewhat irrelevant. This is still hyperkinetic jangling punctuated by the occasional drone, and the songs are mostly solid. Only the slightly weaker but more diverse material (Eastern European folk songs!) from Unknown Country detracts from the uniformly high quality of the music. 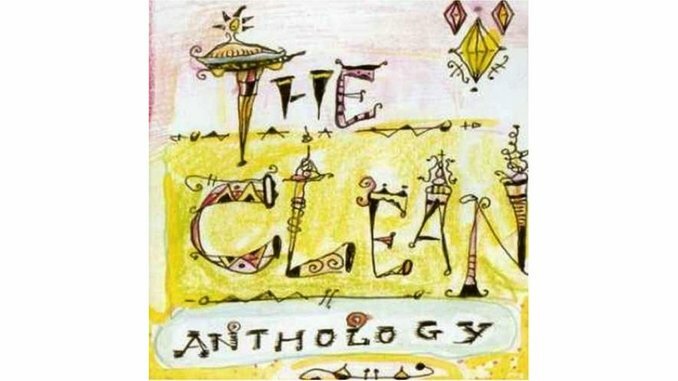 Although the band released two more fine albums in the new millennium, Anthology is still the definitive collection of The Clean’s music. In spite of its minor flaws, it’s the cornerstone of Kiwi indie music, an essential collection that retains its freshness and vitality.